Get Both Farm Theme Toys for just $ 4.50 -- MUST SELL -- Make me an Offer -- For 1 -- OR BOTH !! Buyer to pay U.S. Shipping, or items can be picked up. Cash or Money Order only. 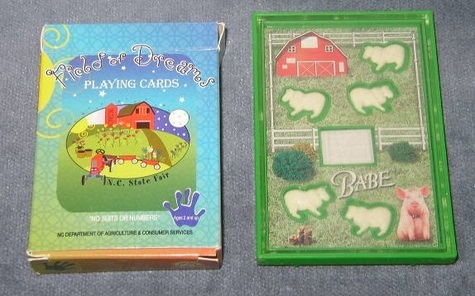 Field of Dreams Playing Cards from the 2004 NC State Fair - "Agriculture is North Carolina's #1 Industry." Complete Set with the Instructions Card that explains 3 Different Games (Memory, Reverse Old Maid, & Go Fish !) The Set includes 1 Commodities Card, & 54 Playing Cards, each with the Field of Dreams Farm Scene on Front, & on the back: Livestock, Fruits, Vegetables, Agricultural, Aquacultural, Poultry & Dairy & More ! Rare, Vintage Game - Get 5 Sheep in the Pasture all facing the right way & Close the Gate (like the pic shows).